With everything office workers have on their plates, cleaning up their work station probably isn't a main priority, but tidying up the office is great for productivity and promoting better waste reduction practices. Now that spring has officially sprung, it is the perfect time to kick off the spring cleaning efforts in your office! From coffee cups, to cardboard boxes, to electronic waste, read on for helpful tips and ideas to manage these items for a healthier, more sustainable work space. Do you ever feel like you could pile the disposable bottles and coffee cups you use throughout the week up to the ceiling? If so, you're not alone. Americans use over 16 billion paper coffee cups and 26 billion plastic water bottles per year. Disposable drinking containers have become a staple in most office worker's day-to-day life, but the majority are not recycled. A thin plastic lining in paper coffee cups prevents them from being recycled, resulting in 100% going to landfills. Furthermore, only 23% of plastic bottles end up being recycled in the United States. These figures are concerning but can easily be improved upon by replacing disposable containers with reusable bottles and mugs. By switching to reusable drink containers, you alone will replace 500 paper coffee cups, and 156 plastic bottles per year! 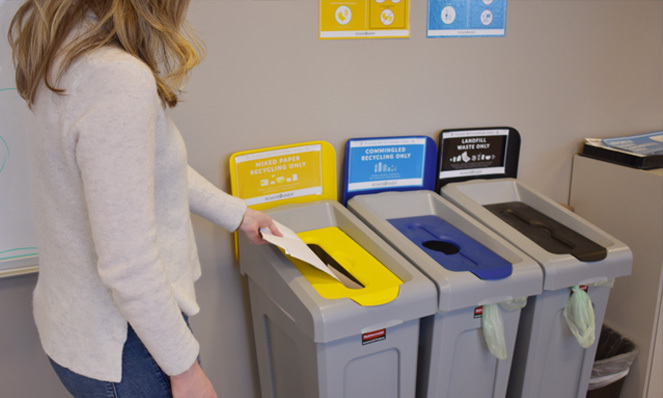 Until your office swaps disposable containers with reusable containers, it's easy to recycle your bottles in the recycling bin. If you think 500 disposable coffee cups seems like a large number, then you might be shocked to learn the average office worker uses 10,000 sheets of paper per year. Eliminating paper products entirely in your office is nearly impossible, but office paper is recyclable along with colored paper, newspapers, magazines, mail, envelopes, paper bags, post-its, and shredded paper. So, if your office is still buried in your company's paper archives from 2014, spring cleaning is the perfect opportunity to sort through your documents and recycle paper materials you no longer need. You can also make organizing your documents easier by switching to paperless documents. Not only will this help cut back on hard copies and create less waste, but it will help save time spent filing paper work in the future. E-waste is one of the more challenging types of waste for businesses because no one knows what to do with old phones, broken monitors, and the numerous other gadgets that accumulate inside a workplace. These "dead" electronics make up the world's fastest-growing waste stream. In 2016, The United States generated 6.9 million tons of e-waste (42 pounds per person), most of which went straight to landfill. This is concerning because electronics contain elements and components like lead and mercury that create environmental and human-health risks when they are disposed in landfills. Electronics also contain valuable materials including gold, silver, and copper that are lost if improperly disposed of. The EPA has resources available for individuals and organizations around the globe who are looking to recycle, donate, or trade in their electronics. If your gadgets are still in good condition, many electronic manufacturers offer trade-in or buy-back programs for your unwanted devices. Learn more about the implications of e-waste in our post, The Dark Side of E-Waste. Most products shipped to your business are packaged in cardboard boxes. 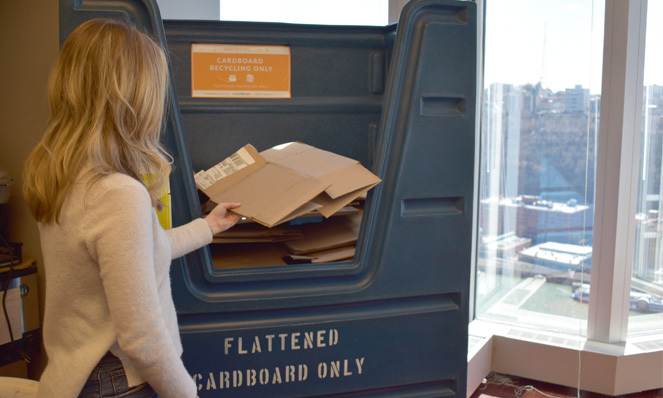 In fact, studies suggest that cardboard represents 15% or more of the solid waste generated in office spaces. One tip we always share with business owners and managers who generate large amounts of cardboard: break it down for recycling. Boxes that aren't broken down are bulky and take up extra space in your containers, which leads to more frequent pickups, and results in more expenses for your business. For guidance on properly breaking it down, check out our resource for step-by-step instructions. If you are like most of us, you have coworkers who leave their lunches in the fridge for months until someone else throws it away. If your office doesn't regularly clean out the fridge, now is a great time to start. Food waste and organic materials make up a large portion of a business’s waste stream. Each day, the average person throws away nearly one pound of food waste. 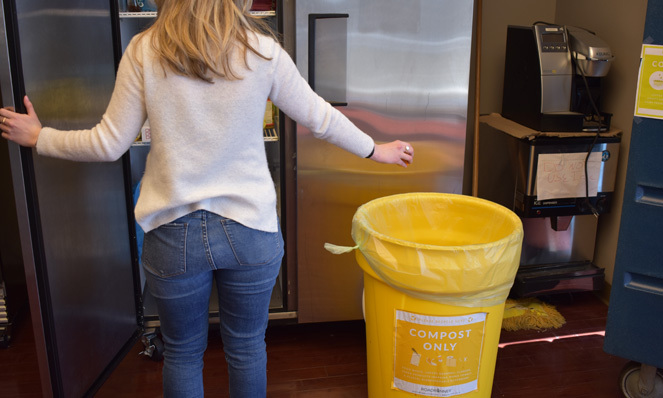 Instead of feeding the landfill, change how your office handles excess food and start composting. Composting decreases waste disposal costs and encourages employees to waste less food. This way, you won't have to fight for space in the fridge anymore. If you are particularly passionate about championing your office's compost program, learn how to get started here! In the meantime, round up a team who is responsible for cleaning out the fridge. Compost the organic materials, recycle the unwanted containers, and throw away everything else. Even though the majority of an office's waste stream is recyclable, there will always be items that cannot be recycled. (We're looking at you, Styrofoam, plastic bags, and greasy pizza boxes.) It's easy to mistake these items as recyclable, but recycling them will contaminate the rest of your materials. Luckily, in most cases non-recyclable items can be replaced with reusable alternatives to make a big impact on your office's efforts to recycle more and divert a significant amount of waste from landfill. 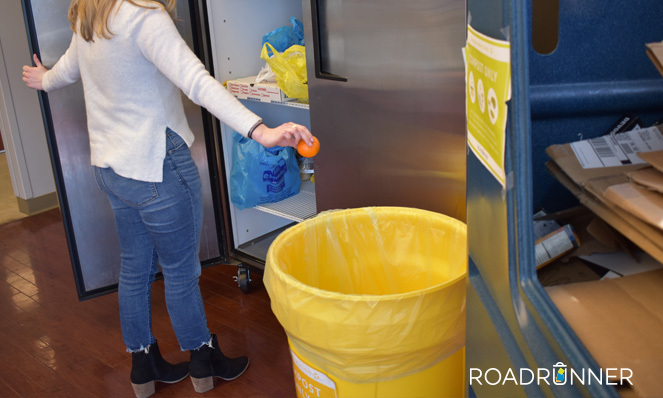 RoadRunner's headquarters has vastly reduced the amount of waste we produce by replacing plastic silverware with reusable forks and knives, Styrofoam cups with reusable mugs, and plastic bottles with reusable water bottles. We understand it can be difficult to remember which items can and cannot be recycled, so we created a resource for your business to reference - find it here. Spring cleaning doesn't have to happen just once a year! By following the steps above, you can help make sure that your office stays healthier and generates less waste all year round. Once your coworkers discover how easy it is to maintain these steps, you will be surprised about the organizational buy-in your program will receive. If you feel ready to start making change, then Eco-Ambassador may be the role for you! Learn how to take charge as your office's Eco-Ambassador here. Excited to start your office's spring cleaning? Let us know how it goes in the comments below by sharing any tips or personal experiences. If you have questions, one of our recycling experts will be happy to assist you - get in touch with us here. Happy spring cleaning from our office to yours!